And not just a Pokémon x-ray machine, but a mobile Pokémon x-ray machine. In Japan, Pokémon is branded for products that range from instant noodles to sickness masks. This Pokémon x-ray machine from Shimadzu Corporation is directed not just at kids in the hospital, but kids in the hospital that are bed-ridden and unable to get their x-rays taken. If the Pokémon characters don't brighten up someone's day, hopefully those amazing Poké Ball wheels will! Don't expect this rolled out at every hospital. 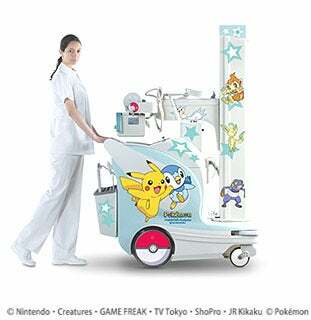 According to Shimaduz, there are plans to make only thirty of these Pokémon themed x-ray machines for all of Japan.